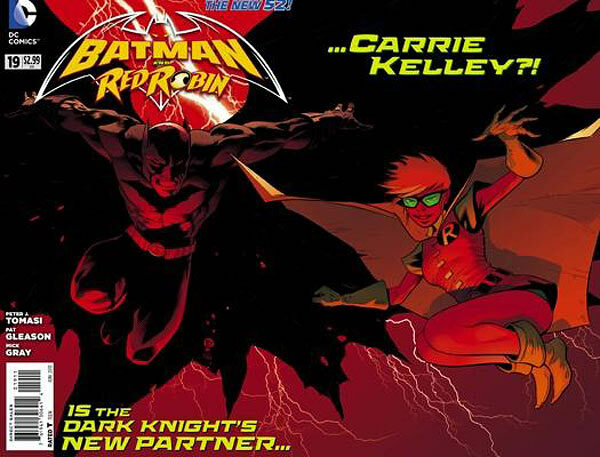 Carrie Kelley is now in continuity so what will be her role in Batman & Robin? Will she become the new robin? To know more, read the review by clicking the jump. I have to say that the announcement that Carrie Kelly would be joining the DCNU is a shock I still have not managed to fully process. Out of all the oddball characters who are worthy of a possible starring role in the DCU, Carrie is somewhere at the very, very bottom of the list. I mean, she was okay in The Dark Knight Returns and DK2, but…making her the new Robin in mainstream comics? I can’t say I ever saw that one coming. Of course, we do not actually know if Carrie will be the new Robin, but DC has definitely implied that this is the case. We also have Batman and…’s rolling list of guest appearances which is kind of cool. I actually think it would be fun if Batman and… continued to be a team up book for Batman, but it seems likely we will be seeing Carrie or some other character fill the pixie boots sooner rather than later. Still, this issue promises that my ex-favorite Robin will be joining the Dark Knight, and these two character have had basically no significant interaction in well over a year, so could it be that a Peter J. Tomasi (former editor of Hitman and current writer for Batman and… and Green Lantern Corps) can finally make the DCNU Red Robin a likable character? I have to say, I’m not holding my breath. Does Batman and… #19 gives us two great Robins for the price of one, or is DC trying to sell us a bill of goods? In this issue, Bruce Wayne meets Carrie Kelly before kidnapping Frankenstein and attempting to use his life force to resurrect Damian. If the intention of this issue was to convince me to like Carrie Kelly, it failed on several fronts. First up, Carrie is a college student apparently interested in acting and directing, and my experience with actors and directors is that they tend to be stuck up, self-righteous, pretentious snobs. I’m sure there are exceptions, but nothing in this issue particularly convinces me that Carrie will be the exception to this rule. On the first page, Carrie throws a pizza in a guy’s face for hitting on her which seems like a bit of an overreaction to me. Yeah, I guess the guys were being a tad inappropriate, and there are many things that an obnoxious guy could say which would justify this action, but the phrases, “Hey baby! I love redheads,” and “Want to share your pizza with me,” do not qualify. Beyond that, we don’t really see too much about Carrie that is particularly insightful. She pays her bills on time, so she is responsible. She has the decency to ask if the music was too loud when Bruce knocks on her door, so she is not completely inconsiderate. She can quote Shakespeare from memory, so that implies some intelligence though quoting it to herself in her car goes back to my, “she is pretentious” theory, but perhaps I am being too harsh. If Carrie Kelly is indeed supposed to be the new Robin, then I fear DC will use her video game experience as a justification for her fighting prowess when the time comes. Apparently, Carrie was acting as a video game tutor to Damian, and at the end of the issue, she is shown playing a motion based fighting game. Now any gamer can tell you that motion based fighting games do not work very well in the real world, but even if we assume that the tech is more advanced in the DCU, I still don’t buy that this would create any real fighting skill because the computer is reading 3D movements and converting it to a 2D plane, and fighting games rely on character abilities, stats and a set of moves, so even if physical actions did act as a controller for game actions, they would not really match up to real physical movements. Perhaps this will not be used as a justification for fighting skills at a later date, and I hope not because it doesn’t make sense. Not only did Carrie Kelly come off as unpleasant in this issue, Batman came off as darn near sociopathic in his own right planning to disassemble the hero Frankenstein in order to resurrect Damian. Sure, he says he will put him back together, but even if Frankenstein is incapable of feeling the pain of being taken apart piece by piece, it still amounts to nothing more than kidnapping. I was on the verge of buying into Bruce’s actions, but it did not quite work for me. Perhaps if Frankenstein were a villain Batman were using or if Batman tried to request help and Frankenstein forcefully resisted, it would sit better with me, but Batman just out and out goes villainous in this issue, and I’m not cool with that. I’m not sure if it was some editorial mandate, or if all the writers just suddenly thought this was a good idea, but can we stop with this whole Penny-One nonsense? In addition to being a bad codename, for concealing Alfred Pennyworth’s identity, it sounds just plain awkward, and why call him Penny-One? Is there some Penny-Two running around in the Bat Family? One of the best things about Peter J. Tomasi’s run on Batman and Robin is that he has really developed Alfred as a character. In most Batman stories, we might see a good Alfred moment once every few issues, but Tomasi gives us a couple good moments in every issue, and this one is no exception. We really get a good sense of Alfred’s role in the family and how he guards Bruce’s soul like a father even when Bruce refuses the comfort of aid of Alfred’s protection. (Spoilers for the Rest of Paragraph) By far my favorite line of this issue is when Red Robin was complaining about Batman’s nature saying, “Sometimes I wonder if he needs anybody,” to which Alfred replied, “And I’d prefer you show him some respect before I lose my temper.” It’s always nice to see the usually calm and gentlemanly Alfred put the smack down on a young pup. Does this issue show me why I once loved Tim Drake? No, not by a long shot. I read the Flashpoint issue of Frankenstein, and other than that, I have never seen the character in his own title, so I have no real point of comparison. That being said, I did think he was pretty cool in this issue. He keeps his cool even under these extreme circumstances, and he seems to be trying to teach Batman a lesson. Furthermore, he gets into a brief fight with Bruce, and he gives as good as he gets, so props for holding his own against the bat god. 1. It’s worth mentioning that this issue is two pages longer than usual. I appreciate the little things. I respect Tomasi’s goal to let Batman travel all the different stages of grief, but I felt Bruce went over to the dark side in this issue, and that is not the hero I want to see. Also, Carrie Kelly does not put her best foot forward (at least I hope this is not her best foot) for her debut, and she also does not really fit well with the rest of this story. Red Robin and Frankenstein were both okay additions, but it did not feel they were fully utilized. All in all, the story is spread a bit too thin, and it delivers a vision of Batman as a man near crazed with grief. I would caution you only to buy this if you are a big fan of Batman and Robin or if you are extremely curious about Carrie Kelly’s DCNU debut. Jeremy is a a collaborator for DKN, but he also has his own Batman site called BatWatch.net. You can check him out there as well. See his other Batman book reviews down below of your favorite Batman universe characters.